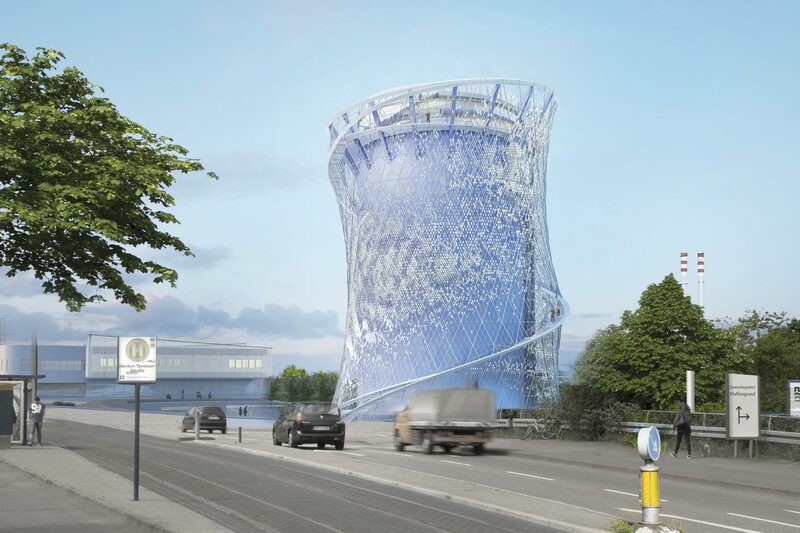 The "energy and future store" stores heat from combined heat and power generation for the district heating network: When a lot of electricity is needed, the heat generated at the same time is stored - like in a thermos flask. When consumers need to heat, it is released again. This replaces oil and gas at cold spells with renewable energies. The cylinder has a diameter of approx. 25 m and a height of approx. 40 m. The storage tank has a modern facade construction. 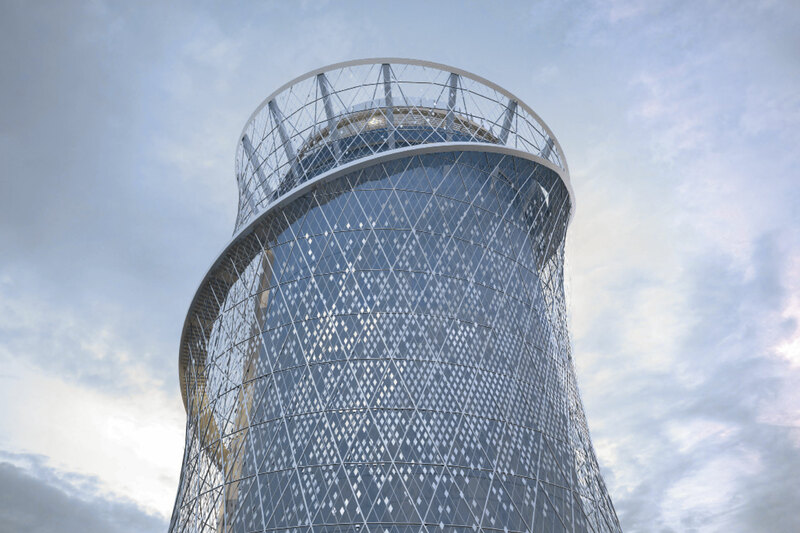 A gastronomic facility will be installed on the storage tank, which will lead to a total height of about 55 metres, with elevators and a circumferential staircase. The use of the levels will be limited to a maximum of 200 people. The highlight of the publicly accessible bistro and the event room is the all-round view over the valleys oft he rivers Rhine and Neckar. So the question arises: "What kind of facade combines the requirements for thermal insulation in summer, good daylighting and unhindered views? Transsolar must therefore achieve the following: A clear view to the outside, sufficient daylight everywhere and a pleasant climate inside; always with consideration for resources, users, costs and open to new, different and unusual solutions. Simulations on computer models combined with site-specific weather data are the tools for this. The 4.4m high, all-round glazed façade of the upper floor is ideal for a clear view. The problem, however, is the possible solar radiation. A solar control glazing, which alone absorbs the heat input, produces a strong discoloration of the light. A movable sun shield effectively reduces solar gains, but obstructs the panoramic view (analogy glacier glasses). Fixed horizontal sun protection can shade the façade and provide a view (analogy Sombrero). Which fixed sun protection meets the requirements for daylight, shade and view? Solar rose" as a design tool: August 15 was chosen as the date for the design of the solar shading as the position of the sun is decreasing but the outside temperature is still often high. This means that on a sunny day it could quickly get too warm. The limit value of the max. 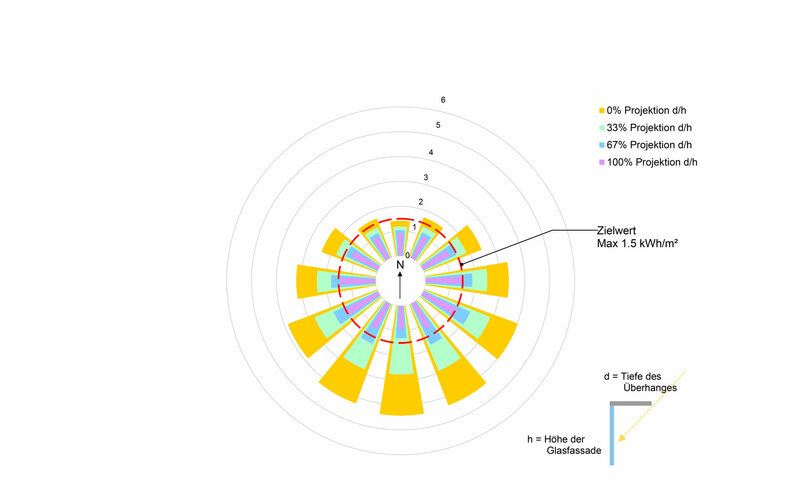 solar input per day was set at 1.5 kWh/m². This ensures that the summer thermal insulation according to DIN 4108 is met and that it is still possible to achieve the desired thermal comfort only with radiant cooling even when fully occupied. 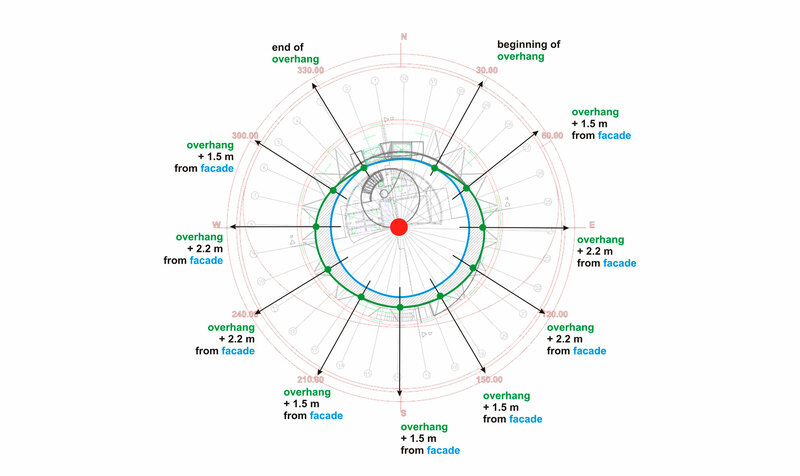 A solar rose (derived from a wind rose) shows the result of the simulation in Figure 2. Depending on the orientation, the necessary quotient between the depth of the overhang d and the height of the glass façade h can be read off, which is necessary to reach the target value of the solar inputs in the daily average. From this the depth of the "roof overhang" can be determined. 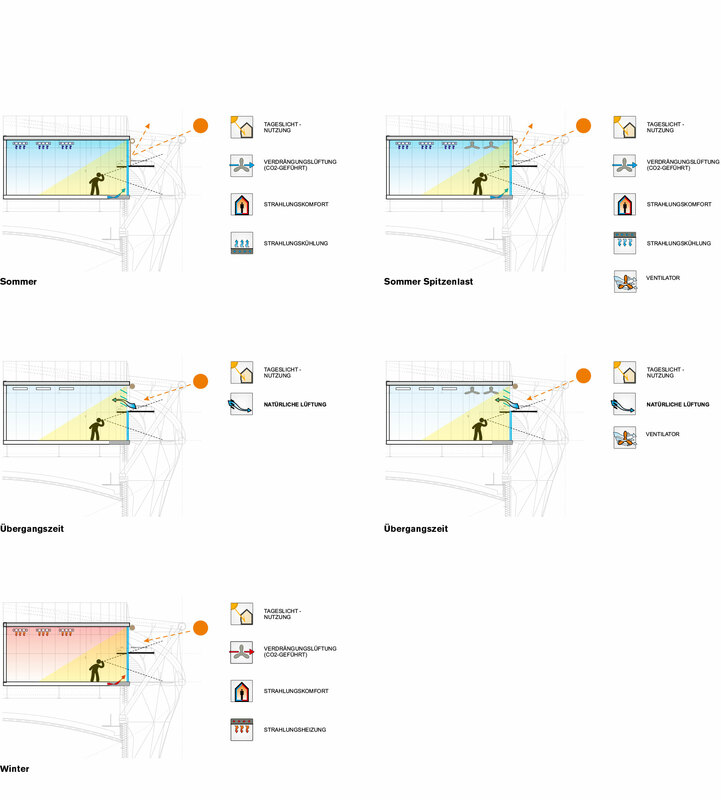 For a glass facade with a height of 4.4m, full shading with d/h=1 would require a projection of 4.4m - which would lead to structural problems on the one hand and to a restriction of daylight in the depth of the room on the other. Translated into the analogy of the sombrero: Such a sombrero would be too large. The solution of the problem is a combination: Horizontal fixed sun protection, above it "roller blinds", which let light in as needed. With this hybrid the analogy to the classic sombrero ends, because the now not quite so big "hat brim" is lowered and over it supplemented with "blinds".